Features:Using dual 210 fish-eye lenses to record video and stitches the data into a panoramic video, support for real-time preview.Provides 3K(3040 * 1520 30FPS) HD videos for you.Professional material for Virtual reality devices such as VR headset.Supplied with a VRcasewhichyoucanusedwithyourphone,itwillprovideavividpanoramicworldforyou.Can be used with FPV, to catch wonderful panoramic views for you.Different free softwares to help you manage videos and photos.Apple MFi certification, support for iPhone 6 / 6 Plus / 6s / 6s Plus connecting, you can share with your friends directly(for iPhone 5S, you may need another USB line for connecting).Compact and exquisite design with high quality aluminum alloy, ideal for wedding, film production, press conference, concert, party, etc. Insta360 Nano gives you a brand new 360 Degree virtual reality experience. Crafted as the world tiniest spherical camera, it allows users to take 360 Degree photos and videos with just a few fingertips. 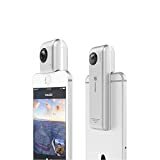 Perfectly compatible with iPhone, Insta360 Nano can be plugged into your smartphones directly for your panoramic shots. 360 Degree photography has never been more simple and convenient. Insta360 Nano is featured with a high-standard resolution of 3040x1520 for images and 3040x1520@30fps max for videos, to optimize your 360 Degree artworks. Its MicroSD storage capacity up to 64GB can indulge your volume of 360 Degree photos and videos as well. With Insta360 Nano, you can share your 360 Degree images and videos to your social networking platforms such as Facebook. Live streaming in a 360 Degree fashion on Facebook and YouTube is also achievable with the Nano. The portability and user-friendliness brought along by Insta360 Nano makes it a revolutionary spherical video camera. It aims to become a handy necessity for each and every of you who wish to embrace the world from all angles. Insta360 Nano gives you a brand new 360 Degree virtual reality experience. Crafted as the world tiniest spherical camera, it allows users to take 360 Degree photos and videos with just a few fingertips. 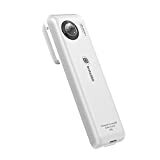 Perfectly compatible with iPhone, Insta360 Nano can be plugged into your smartphones directly for your panoramic shots. 360 Degree photography has never been more simple and convenient. Insta360 Nano is featured with a high-standard resolution of 3040x1520 for images and 3040x1520@30fps max for videos to optimize your 360 Degree artworks. Its MicroSD storage capacity up to 64GB can indulge your volume of 360 Degree photos and videos as well. With Insta360 Nano, you can share your 360 Degree images and videos to your social networking platforms such as Facebook. Live streaming in a 360 Degree fashion on Facebook and YouTube is also achievable with the Nano. 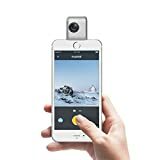 The portability and user-friendliness brought along by Insta360 Nano makes it a revolutionary spherical video camera. It aims to become a handy necessity for each and every of you who wish to embrace the world from all angles. 3040x1520 resolution @ 30fps Compatible with iPhone 6/6S, iPhone 6 plus/6S plus; It could be used alone Dual 210 Degree Fisheye Lenses; Portable size Real-time 360 video/photo sharing on Facebook/WeChat, Live streaming Free app, 360 player/studio/plugin, VR cardboard box. "Specifications: Lens: Dual 210° Fisheye Lenses CMOS Sensor: Adopts for Sony 8MP CMOS Sensor Video Resolution: 3040 * 1520 30FPS Image Resolution: 3040 * 1520 Shutter Speed: 1/8000~2S Storage: Support for SD card max up to 64G(not included) Software: Insta360 Nano, Insta360 Studio, Insta360 Player Battery Capacity: 800mAh Item Size: 11 * 3.3 * 2.1cm / 4.3 * 1.3 * 0.8in Item Weight: 72g / 2.5oz Package Size: 16.3 * 9.3 * 5.5cm / 6.4 * 3.7 * 2.2in Package Weight: 315g / 11.1oz Package List: 1 * Camera 1 * USB Cable 1 * Carrying Bag 1 * VR Case 1 * Guide Book 1 * User Manual(English & Chinese)"